CONGRATULATIONS WINNERS Denise Spillane, Ajae McCain and Patricia Upshaw!!! I’m thrilled to have been asked to write a couple of articles for a brand new publication all about my favorite subject matter! I’m eagerly awaiting my hard copy of this magazine, but already downloaded it because I couldn’t wait! Also stay tuned for some cool extras that will be coming along with this issue! Be sure to read all the way through this post to find out about a special GIVEAWAY that I’m offering!!! 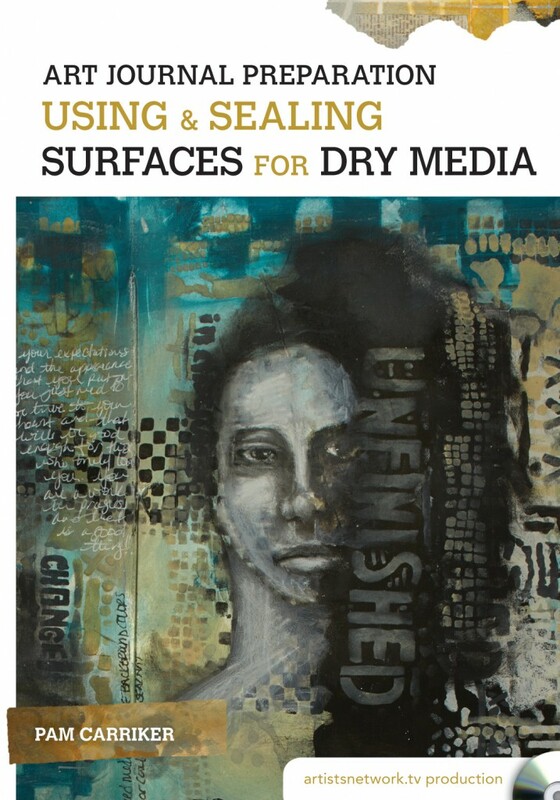 Discover a wealth of information and instruction for creating mixed-media faces! 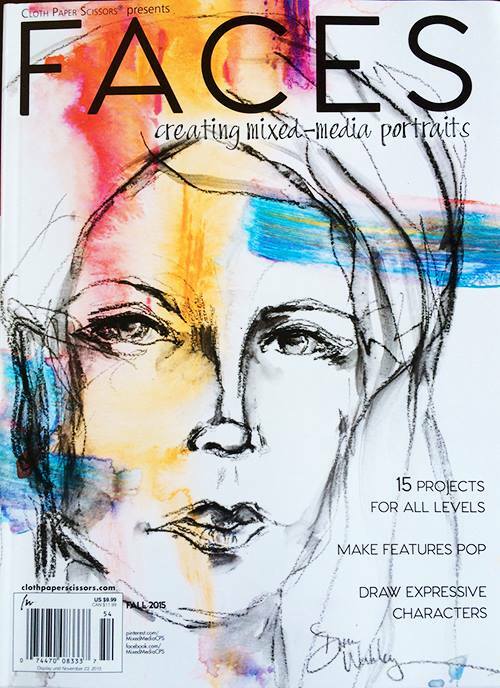 From the editors of Cloth Paper Scissors magazine comes the premiere special issue magazine dedicated to mixed-media portrait art: Faces. Some of my artwork from this issue. I also have some new DVD’s that go along really well with the types of techniques I share in the magazine. You can find out more about them by clicking on the images below. i would never have even considered trying to draw a face – just not something I could do. Now after watching you and understanding the features i have tried to draw some faces. still so challenging but I have tried something new out of my element and I am enjoying tbe challenge. Thank you. I would love to see your DVDs! I have purchased all of your books, and it would be wonderful to see the process as I am better at learning visually. Thank you for all that you give to us! I’m always fascinated when I watch you work! Thank you for the chance to win! Wow! I am thinking about doing portraits of my great-nieces but I feel the proportions differ from adults. Is that correct? Congratulations! I’ve purchased and downloaded the digital version because I couldn’t wait for the hard copy. This is definitely something interesting to me. I am drawn to faces. When I doodle I doodle faces. Wow! That magazine looks great! And I’m sure those DVDs are top notch like your other products. Would love to win them. Thanks for the chance! Thanks for the cHance at this! Love your faces! I would LOVE to win one of your DVD’s!!!!! Thanx Pam! I keep hearing about your work, saw this link on Facebook, and now I see how cool your art is. Would love to explore what you’re exploring! Cannot wait to get my hands on this book – congrats on being featured!! Your work with faces continues to amaze and inspire me – thanks for the chance to win your video!! Another awesome resource, can not wait to soak it all up! & thanks for the chance to win an amazing prize package! 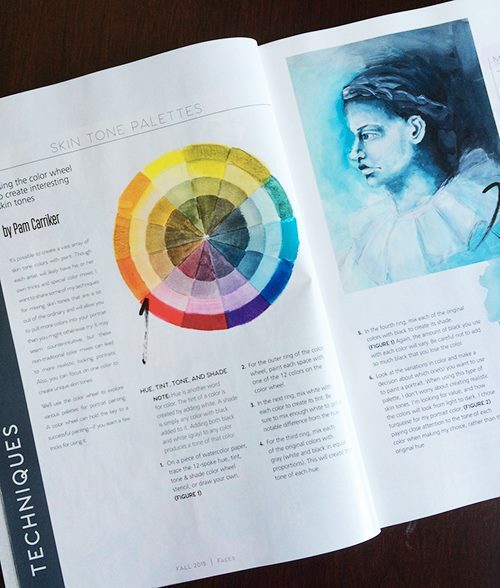 Having such fun using your book, Pam – it’s well-written and user-friendly. Would LOVE to add one of your DVDs to my learning process. Thank you for your inspiration. Congrats on “Faces”! Currently in a ATC frenzy creating faces on paper bag paper due to your book! Kudos to you Pam! You are one of my inspirational teachers and I keep a photo of you posted in my studio room as a reminder :). I hope I win. That would be so awesome :). Thank you Pam ,I love the work . I have your new book faces and just look at it, am so excited to dive in…would love to give one to my painting buddy. I’m excited to see the new Faces magazine. Your articles are always fantastic! Great giveaway Pam. I have your books and I think the color DVD. Love learning from you. Congratulations Denise!!! You have one 1 of my new DVD’s! Please email your mailing info to pamcarriker@gmail.com and I’ll get it sent to you asap! How exciting Pam!! Can never get enough of your teaching style! Congratulations. I got your new book last December and love it. It is fantastic and has taken my understanding of the planes of a face etc to a new level – they actually look real now not whimsical. I also love your colour combinations and would love to win a DVD and learn more. Thank you for continuing to inspire us with your creativity. Am looking forward to reading your article in FACES. I really enjoy your informative and encouraging books and dvds. Thanks for sharing your wonderful ceeativity with us. This new magazine looks very interesting. Congratulations on being in the first issue! I love drawing & sketching faces. Especially of women. Thanks so much for the chance at the giveaway. Faces fascinate me! I really want to learn to draw and have Pams book. I do not have patience (am working on that) so I need all the help I can to improve! Congratulations! Love your book! Would love to ein the dvd! !I am going to order Face! Thank you for share your art, talent and being an inspiration! I hope this becomes a regular issue! The Faces magazine looks amazing, as does your DVD. I love your creations. Thanks for all of your wonderful inspiration. Bravo Pam and thanks for having such a great giveaway. I have your book and would love to win a DVD. This new publication also looks like a must-have. Thanks again. I am looking forward to getting Faces….. so many of my favorite artists in this. Congratulations…. I can’t wait to get my copy! Wonderful, Pam! I’d love to win one of your DVD’s. All the best! Pam! Congratulations on all the good things happening for you. I have learned from your videos and I love my speed books and drawing book of yours. Thank you for the chance to win! Take care and STAY POSITIVE! These look flippin’ amazing! I can’ wait to see the products IRL! Congrats on your new pubs! This looks so inspiration- rich! I can’t wait to get a copy!!! Thanks Pam C…and kudos on your wonderful work. Congrats once again Pam. As always, still inspiring! How exciting!! Can’t wait to check this out and get some much needed fodder for my muse. Pam, you never cease to amaze me. Love the new magazine concept. I am eagerly waiting for this issue to come out!!! Thanks ever so much for the giveaway!!! Always been a Pam Fan : ) So happy for your success, so deserving! Congratulations Ajae!!! You have one 1 of my new DVD’s! Please email your mailing info to pamcarriker@gmail.com and I’ll get it sent to you asap! Super giveaway, the magazines look fabulous! The magazine looks great, I’ll be sure to pre-order a copy. Thanks for the giveaway! This looks marvelous! I would SO love to win a copy! …you’re so fabulous! Fingers crossed on this one. I would love to have one of the new dvds! Thank you for the chance. Ohhh I would love love love to receive one of your DVDs! Love your style! Pam, I have been following you from the start and loving every minute of it! I did the download for Faces and it’s wonderful!!!! I hope to learn a lot from it. Congratulations Patricia!!! You have one 1 of my new DVD’s! Please email your mailing info to pamcarriker@gmail.com and I’ll get it sent to you asap! Oh Pam, how wonderful for you! You know what they say, “Good things happen to good people.” I always smile when I see that I have mail from you! I know it’s going to upbeat and full of good news and helpful information 🙂 I’ve watched your demonstrations countless times and never stop being amazed at what a little shadow here and a line there can do to completely change the look and how this communicates feelings from your drawings. Your book has helped me and I so enjoy drawing faces now. Would love to win this. Thanks again. Thanks for always willing to share your talent and encourage others to just try! I’d love to win one of these DVDs. Thanks for offering these! 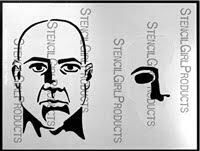 I have one of your books and have been practicing and I have some of your stencils from Stencil Girl as well. Your techniques are wonderful and helpful and your art is gorgeous. Thank you for offering the chance at your DVDs – someone will be doing a happy dance! Congratulations! I love your work. In fact, my favorite (face) that I created was from a class of yours I took online. I’ve continued learning from both of your books. Can’t wait for the printed copy…I’m so excited to be able to download the mag until it comes…I just love your process Pam…I’m one of your avid fans! Lovely works! Thank you kindly for the chance to win. Pam thank you for your generosity with your time and sharing with those of us who are new to this field. I would be so honored to receive a DVD. Congratulations on being included in what appears to be a wonderful venue! 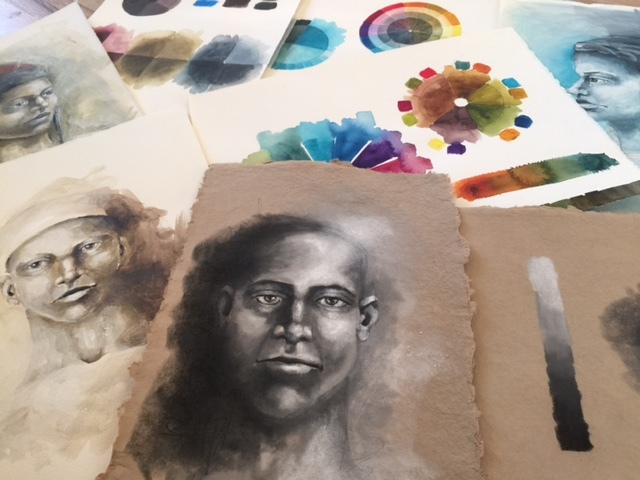 I’ve been working with your book Mixed Media Portraits, and the magazine and videos look like a great adjunct! Thanks for the generous give-away! 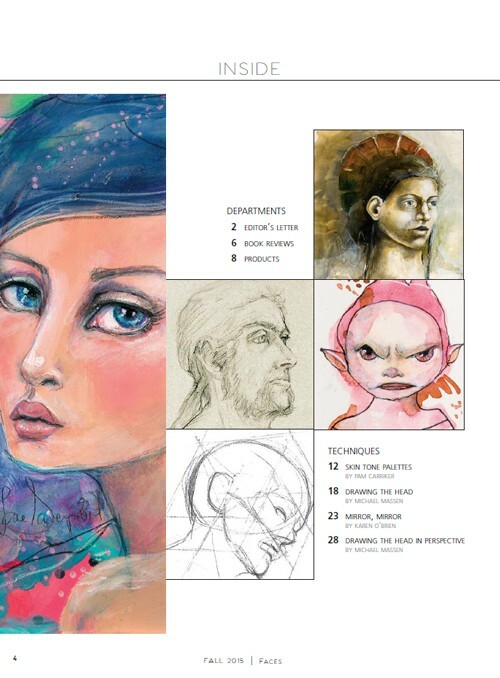 What a wonderful collection of information, styles and techniques for creating beautiful “Faces.” Would be a great addition to my resources. Thank you for this generous offer. that really does look like a wonderful magazine! such a generous give away too. 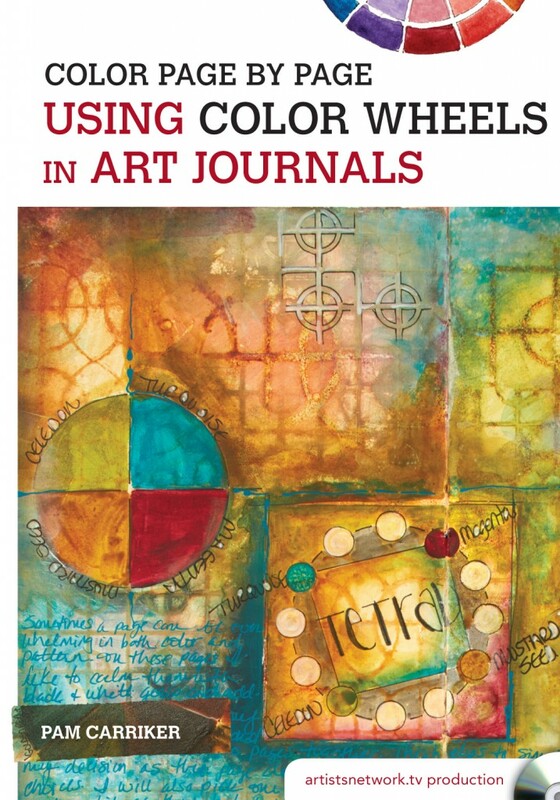 I eagerly look forward to any and all art journaling and portrait drawing work you produce. Thank you for sharing with all of us through your books and tutorial articles and videos. Really like your faces and would be thrilled to win the giveaway! 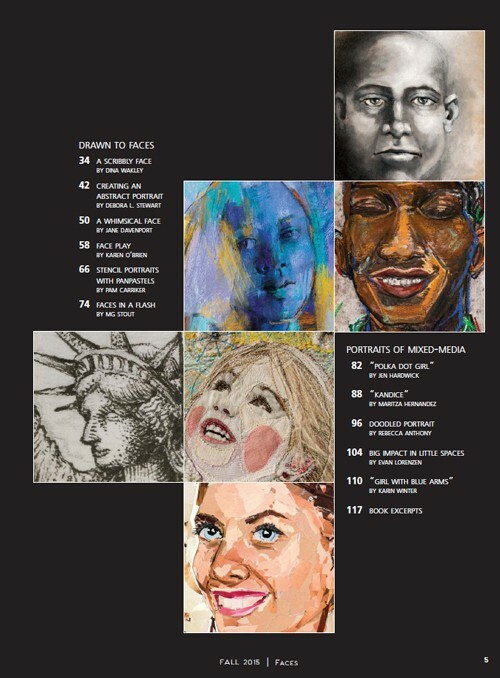 I love to draw faces — so really looking forward to this new magazine. Would love to be the winner of these DVD’s as they would really be a help in my creative education. Thanks for a chance to win your products. Good luck with the new magazine. Love, love, love this! Can’ wait to see the magazine. Thanks so much for the give-away! I have a lot to learn and would be delighted to win the DVDs! Loved your info about color wheels! How fun it would be to win. Thanks for the opportunity! Wow, these video clips look fabulous! I would love to learn more! I will keep my fingers crossed! How I’d love to win this to help me on my art journey. Great giveaway! Even just the post here is enticing! Congratulations! You must be thrilled with the inclusion of your work in Faces. Every venue that provides artists an opportunity to learn from you is a blessing. 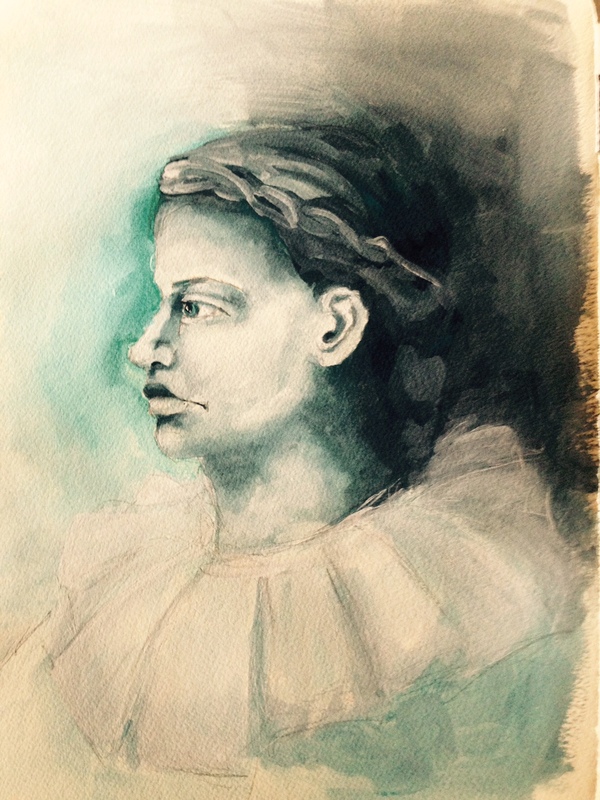 I am very grateful for Strathmore’s free online classes and my introduction of your faces and techniques. To say nothing of learning from you in several live workshops in Phoenix and Irvine, the past few years. You are an inspiration to me. Pam, glad to see your work getting further recognition. Love that you and the mag are going to focus on faces. I own your book, and use it all the time. Am going to do gouache and ink project next week. Would love to have my name drawn, and will definitely be buying. Will check out DVDs as well. Book- ordered! I love that I’ve been dabbling in making faces with you since 2012 and you still come up with so many new approaches! The DVDs are great and I can’t wait to get started doing more exploring. I’m drawing more do I’ll have some new images to work with. Thanks for this opportunity to win a DVDs! Congratulations!! I can’t wait to see this new magazine!! Love your work and so enjoy learning from your previous videos. Thank you for continuing to inspire us. Wonderful to see this new pub! Glad you are included. Congratulations. This looks like an awesome publication. I have been wanting to improve my ability to draw faces and this looks very helpful. I have two of your books and I love them! This one looks awesome too. Thanks for a chance to win. Cool looking magazine! I love your pages. Thanks for the giveaway. I plan on getting the magazine now. Love all the faces. Thanks for the give away! This looks like a fun publication. I’ve returned to the techniques I learned in your “Pursuing Portraits” on-line class again and again. I’d love to learn more! Wow would love to be the recipient of this awesome looking book! I just love your work! Love all the faces. Thanks for the give away!! These look wonderful. I’ve learned so much from your work and have enjoyed using several of your tutorials and products. Thank you for this opportunity. Wow, how exciting to be featured in a brand new magazine! I would love to win a copy of the magazine and be thrilled to win your CD! Thank you for the opportunity! I plan to get the magazine either way! Love your work. Loved your workshop in Charlotte. Preordered FACES. Would love to win your DVDs. I am so excited to go BEYOND the traditional face!!! I absolutely love your art! I would love to win that awesome magazine! Love your work Pam. Thanks for the giveaway opportunity. I’d love to win one of those…..please include me! And can’t wait for the magazine. Thank you! Love you’re art works. Thanks so much for a awesome chance too win this wonderful treasure of knowledge hugs. Pam – all I can say is I love your work and wish I able to take some, if not, all of your classes. I have one of your DVDs you did awhile back and I loved it. BTW – I am ordering FACES! Great giveaway, I would love to receive a copy of your DVD! Oh this is a wonderful give away! Good luck everyone! Awesome! Wish I had it now! Sweet! Love faces and want to learn to draw them! Thanks for the chance Pam! Can’t wait to get it! I’ve downloaded the magazine and am loving it. 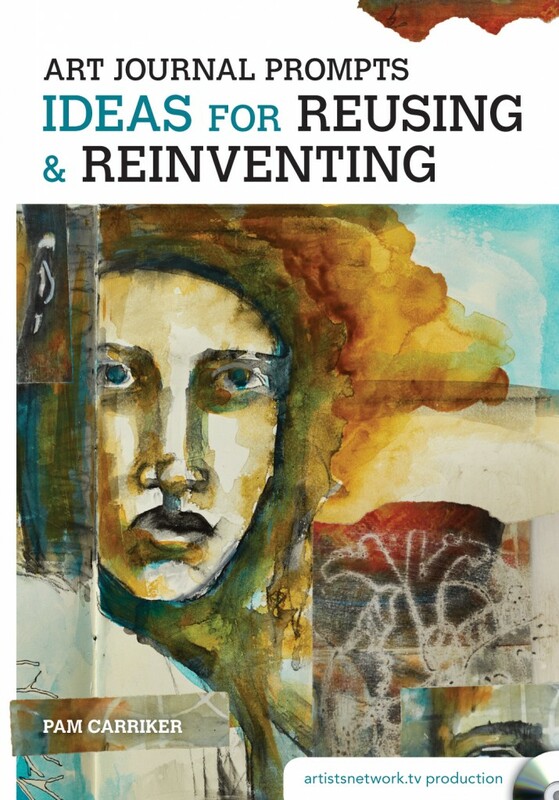 i am enjoying one of your vies already, ‘Reusing & Reinventing’. I would so love the other two. Love love your art. So very cool! I struggle with faces so this is a great product. Oh my goodness! I don’t know whether to wait for the hard copy or download now! This looks like an amazing issue! Thank you for sharing your inspiration with us Pam. So excited for this giveaway!! Thank you for offering! This looks like a wonderful publication and I’d love to win the DVD! Thank you for offering such a great chance to win something that looks very creative! This is so exciting. Congrats. I’m planning on getting a copy in the near future. I’ve been excited about Faces, even more looking forward to your contributions. Thank you! The magazine looks awesome. Can’t wait to read it. How fun to be Inge premier edition! Congratulations. I really NEED this book and the videos. I prefer Pam Carriker in person but DVDs are the next best thing. I always learn so much and am able to improve my faces. Love this book. Wow! I am totally addicted to drawing faces thanks to you Pam. I would love to win a DVD of yours. Looks like a great publication! Can’t wait to see it. This is so exciting!! I love it!! Didn’t realize it was downloadable! I’m headed to go do that right away. I’m in need of some hammock time, this will help me daydream and stir up creative thoughts. Thanks for the op to win a dvd to boot! i had forgotten about that mag.. i’d better go and snag that digital version ( to hold me over till i get the hard copy ) and that last companion guide ( coz of that interweave mixup ) that i forgot to go back to get. i have the downloads but would love the dvd’s too. hope you’re working on yet another book, LOL, I LOVE your books. I love your artwork and you inspired mie. It is great to see how you work. awesome giveaway!!! I love and appreciate your work and your books!!! I would love to win!!! What an awesome opportunity! I can’t wait to get my hands on “Faces”! Thanks for offering this!! Congratulations Pam! I will plan a visit to my LSS and pick up a copy.